Our new house. We moved in this past December. It’s been about three months since my last update, and a lot has happened. I am talking big changes. Noriko and I moved near the coast (actually the new house is only 12 miles from our old one), and I got a new job. All of this happened in just the past three months. We weren't even looking for a new house, but it was love at first sight one Sunday afternoon in November when we happened across an Open House showing. We are quite spontaneous. 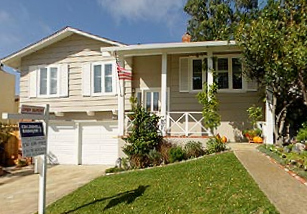 The new house is in Pacifica, Calif., and we love it. Surrounded by green mountains and rolling hills, the Pacific ocean is less than a couple miles down the road. As for my new gig, it’s at Deloitte & Touche: My title is internal communications manager for the Northwest U.S. and Hawaii. Very cool. Meanwhile, my folks back in Ohio report bitter-cold temperatures with a healthy helping of sleet, ice and snow. Here in California, the days have been mostly sunny and in the 60s -- I can’t say I miss Ohio weather, but I do miss Ohio. Of course, if I moved back, I would soon miss California (or “Cally-horn-ya,” as our new governor -- the "governator" -- calls it). 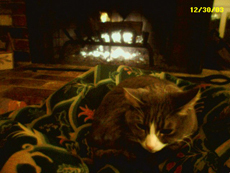 Hubert prepares for a nap by the fireplace. Dad and Mom report having an excellent time in Florida in December, where they rented a little place near the beach in Jupiter. I have a old fraternity brother who lives there with his family, but sadly I was unable to get down there for a visit since we were in the middle of moving at the time. Ichi has taken it upon herself to be the sheriff. I hope she doesn’t get into a skirmish with a raccoon, though. In addition to being crafty bandits (they have already gotten into our trash), they are nasty little fighters.